Ljubljana is hardly the first Central European city you’d dream of visiting. But, oh, how wrong it would be skip out on Slovenia’s capital! Not only is Ljubljana one of the most beautiful lesser-known European capitals, it’s centrally-positioned in pint-sized Slovenia. Even without spending a night in any other Slovenian city or town (not that I’d recommend that! ), you can see much of Slovenia without a fuss. Ljubljana day trips are hard to pin down. One day you could be frolicking in the Julien Alps, the next sipping a cocktail on the Adriatic. From urban outings and outdoor adventures to sea and sun, I’ve included day trips for just about every travel style. Of all of these top day trips from Ljubljana though, the shining stars are the outdoor activities. Slovenia is one of Europe’s best natural destinations. At any time of year. And if you ever needed proof, all you need to do is embark on one of these quick journeys. Whether it’s the deep turquoises and blues of Lake Bled and Lake Bohinj or the mysterious Postojna and Škocjan Caves, Slovenia’s natural beauty will dazzle you. Need ideas for what to do in the Slovenian capital itself? Check out this complete itinerary for one day in Ljubljana! If you’ve only got time to tackle one Ljubljana day trip, make it Lake Bled. There are a ton of amazing things do & see in Bled, but of all the reasons to visit, none is simpler than being amazed while walking around the lake, staring into the crystalline waters among the snow-capped Julien Alps. This 2-kilometre circuit is an easy trek, letting you experience Lake Bled, and its ever-changing hues, from every angle. Got a little energy to spare? Power up to Bled Castle for one of the most epic views in all of Europe. At Bled Castle, there’s a museum you can peruse, or, probably more interesting for most (myself included), a wine cellar where you can bottle and cork your own bottle of Slovenian wine to go. Want to save major time on your day trip? Join in on the small-group private half-day Lake Bled and Bled Castle Tour from Ljubljana! The tour includes round-trip transportation and hotel pick-up in Ljubljana. Also included is a pletna (row-boat) ride to Bled Island to visit the Church of the Assumption of Mary (entrance fee not included) and a trek up to Bled Castle. By public transportation, the easiest way of getting to Lake Bled from Ljubljana is by bus. Buses leave Ljubljana hourly (on the hour) for a 75-minute ride. From Bled to Ljubljana, buses depart hourly on the half-hour. Tickets cost €6.30 each away. Of the all the towns on Slovenia’s Istrian coast, everyone’s favourite is Piran. And who could blame you for loving a day trip to Piran? The peninsular Venetian port town—and one of Europe’s best hidden gems—has pleased visitors for centuries with its winding alleyways and sweeping sea views. Finally, it’s your turn! Start your Piran day trip at Tartinijev trg, the town’s main square named after violinist Giuseppe Tartini. If you think his name sounds a little-less-than Slovenian, you’re not wrong. Between the 13th-and 18th centuries, Piran rocked out in the Venetian Republic. Even as recently as the intra-war period, Piran (Pirano in Italian) was part of Italy. This Italian influence is immediately noticeable as you amble through the medieval streets decked out with Venetian architecture. I wouldn’t at all blame you for forgetting you’re in Slovenia! From Tartinijev trg, push through the wonderfully-claustrophobic ulica IX. Korpusa on route to Piran’s city walls for some sweeping views over the Gulf of Trieste. From here, you may want to unwind with a relaxing walk along the sea or spin off towards Church of St. George (Cerkev sv. Jurija) on Adamičeva ulica for panoramic vistas over Piran. Ascend the Church of St. George bell tower for even bigger views. Slip back down to the town and get lost in Piran’s medieval streets before enjoying a seaside meal along Prešernovo nabrežje. Want to save time and combine Piran with other coastal cities? 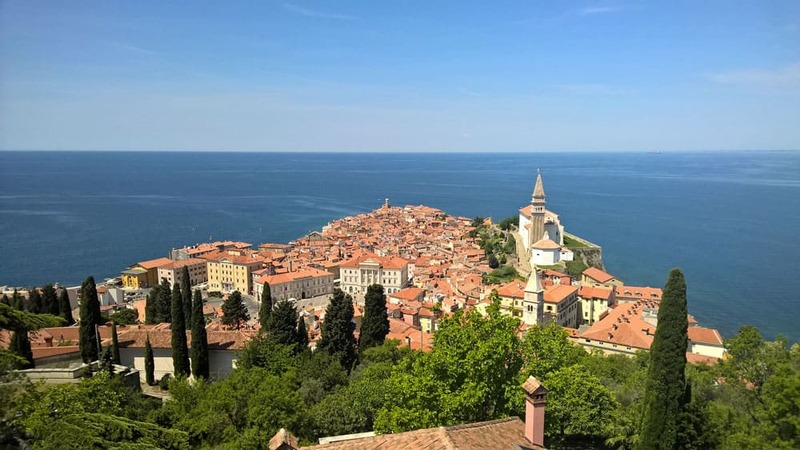 Hop on the small-group private Piran and Portoroz Half-Day Tour from Ljubljana! Both morning and afternoon tours leave from central Ljubljana. The quickest route from Ljubljana to Piran via public transport is by bus rather than train. There are five buses a day from Ljubljana for about €12. The journey lasts about 2 to 2.5 hours each way. Returning to Ljubljana, there’s a 16:15 departure or, if you wanted to stay longer, a 3-hour bus ride leaving at 19:00. You can check the full bus schedules here. Any country would be blessed to have one lake as beautiful as Lake Bled. Slovenia couldn’t settle there. 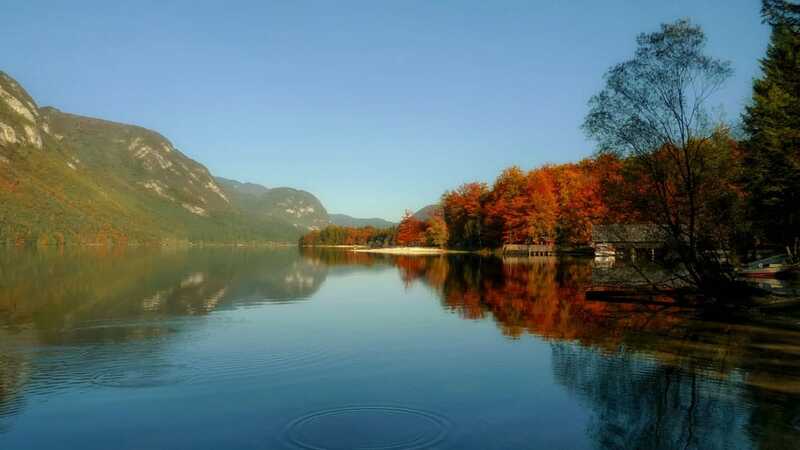 Nestled in the Julian Alps, just 26 kilometres southwest of Bled, Lake Bohinj doubles down on beauty of the aqua variety. Lake Bohinj is bigger than Bled, yet far less crowded. Instead of pushing against an ever-growing tourist horde, at Lake Bohinj serenity is within reach. Who knows for how long this will last! What you’ll tackle on a day trip to Lake Bohinj depends on whether you want to take to the water or the outlying areas. For casual wanderers with a little energy to burn, a walk around Lake Bohinj is a good start. It’s a 12-kilometre circuit that will take you the better part of an afternoon. Those less inclined to walk the circuit can take in Lake Bohinj from, well, the lake! From Ribčev Laz, the main lakeside town, two scenic boats, Bohinj and Zlatorog, zip you across Lake Bohinj. The return ticket for the boat ride will set you back €10.50. Excursions depart about every 40 minutes from 9:30 until 18:10 from May until October. Want to be more efficient with your Lake Bohinj day trip? Hop onto a Alpine Region Day Trip! The tour provides private transportation from your hotel in central Ljubljana and visits Bled, Vintgar Gorge, Lake Bohinj, and Škofja Loka. With public transportation, the easiest way to get from Ljubljana to Bohinj is by bus. Buses depart regularly from Ljubljana Avtobusna Postaja, every hour, on the hour, from 6am until 8pm. The bus ride should take a little less than two hours. For over a century, Vintgar Gorge has awed visitors. All it takes is one look, and you’ll see why. The incredible Vintgar Gorge, 3.5km outside of Bled and one of the best places for hiking in Slovenia, submits yet another reason why Slovenia might be Europe’s most beautiful natural destination. Spend your day trip to Vintgar Gorge strolling along rocky paths, through the galleries and over wooden bridges, set along the Radovna River. The path, extending through the entire 1.6-kilometre stretch, leads to the apex of Vintgar Gorge, the stunning Šum Waterfall. From here, the trail rises eastward towards St. Catherine’s Church where you can steal some of the area’s best vistas. Continue south from St. Catherine’s Church to Bled through Zasip to make it a round trip. Want to save time and pack your day with action? Book yourself onto the awesome Alpine Region Day Trip from Ljubljana. The tour includes private transportation to Bled from Ljubljana and time in Vintgar Gorge, Lake Bohinj and Škofja Loka with a private guide. Using public transportation alone to get to Vintgar Gorge can be a little tricky. First, find your way to Bled from Ljubljana (check out Lake Bled section above for more details). There’s one bus that leaves from Bled to Vintgar Gorge departing at 10am. The bus returns to Bled at 12:30. The other option is to walk to the gorge from Bled. From town, follow Prešernova cesta north, hanging a right on Partizanska cesta about a kilometre later. Follow Partizanska cesta to the y-junction where you will swing left on Cesta v Vintgar. This road will lead you to Podhom, where you’ll see signposts to guide you to the entrance of Vintgar Gorge. If you want to carve out your own itinerary, renting a car in Ljubljana is another convenient option. Driving in Slovenia isn’t overly difficult, and compared to bordering countries like Austria and Italy, is a fairly cost effective option. For a town as incredible as Škofja Loka, it’s amazing how few travellers ever speak of it. If you’re visiting Ljubljana, don’t leave without a day trip to Škofja Loka. It’s about as easy as Ljubljana day trips come and it might be the most breathtaking half-day outing you’ll find anywhere in Central Europe. Škofja Loka takes honour as the best-preserved medieval town in all of Slovenia. Start exploring old town from Town Square (Mestni trg), Škofja Loka’s switchboard. Simply getting lost on Škofja Loka’s ancient cobblestoned streets is the best way to dig into the town. Keep on the look out for Capuchin Bridge (Stone Bridge) at the northern end of old town. It’s the most famous landmark in Škofja Loka and worth snapping a photo or two. After exploring old town by foot, head up the winding path to Loka Castle. Built by the bishops of Freising (Škofja Loka is Slovene for Bishop’s Meadow), Loka Castle is no longer a place of royalty, but hosts Loka Museum. The exhibitions at Loka Museum focus on the history of the castle and of the region. For history buffs, it’s well worth the visit! Want to take in several of these day trip ideas at once? Get the most out of your Slovenia experience the Alpine Region Day Trip from Ljubljana! The guided tour is a real time-saver, covering Bled, Vintgar Gorge, Lake Bohinj and Škofja Loka. From Ljubljana, Škofja Loka is probably the quickest day trip you’ll find. To get to Škofja Loka from Ljubljana only takes about 37 minutes by bus for the low price of €3.10. Buses depart over 30 times a day on weekdays and, oddly enough, 12 times a day on the weekend. It’s slightly quicker to get to Škofja Loka by train, but the train station’s inconvenient location, a 30-minute walk from old town, makes the bus the more attractive option. To paraphrase Ron Burgundy: Škocjan Caves is kind of a big deal. No other excursion from Ljubljana is as important as a day trip to Škocjan Caves. And it’s not just because I think you’d love it. The UNESCO-listed Škocjan Caves is a superstar among geo- and bio-nerds (no offense intended for the scientifically-inclined!). It’s not just a popular spot in Slovenia, but famous worldwide for its unique biodiversity and being home the world’s largest underground canyon. The eleven-cave network at Škocjan stretches over six kilometres and dips over 0.2 kilometres from ground-level. Throughout the caves, dodge stalactites and stalagmites as you pass by limestone pools, fauna and flora. Join the 1.5-hour English-language cave tour (€16) to gain a better understanding of the importance and history of Škocjan Caves. Want to avoid hassles and save time? Visit several Ljubljana day-tripping destinations in one feel swoop on the Slovenian Coast and Karst Region Day Trip from Ljubljana! Includes a trip to Škocjan Caves along with Predjama Castle, Lipica and Piran. By public transportation, getting to Škocjan Caves should take slightly less than two hours each way. It’s not the most convenient route. You’ll need to get a train from Ljubljana to Divača. From Divača station, it’s a 3-kilometre walk on a well-marked walking path to the caves. Check train schedules from Ljubljana to Divača on Slovenske železnice. To say Ptuj had a rough history is an understatement. Settlers first converged upon Ptuj in the Stone Age, making the small city the oldest—and one of the most historically important—in Slovenia. Not much is left from Ptuj’s ancient history. Nonetheless, the city charms you with its red-roofed medieval centre and natural surroundings. Aim to begin your day trip to Ptuj at Slovenski trg, where you’ll be face-to-face with the beautiful Town Tower and Orpheus Monument. Wander around old town Ptuj on foot before heading up to Ptuj Castle to breathe in an epic panorama of the city. Scoot back down to town and relax after a long day of sightseeing with a wine tasting at the Ptuj Wine Cellar (advanced reservation required). Want to supercharge your day’s sightseeing? Combine Ptuj with a trip to Maribor and a Slovenian wine region on the Maribor, Ptuj and Jeruzalem Day Trip from Ljubljana! Ptuj is the real highlight of trip, but wine lovers will relish a chance to enjoy Slovenian wine, relaxing among rolling hills dotted with vineyards! To get to Ptuj from Ljubljana, the easiest option is by train. The train times vary greatly, so be sure to check the schedules before booking your ticket. For day trippers, the 8:05 train from Ljubljana is the quickest, clocking in at total travel time of 2 hours and 18 minutes. Check schedules and prices on Slovenske železnice. Coming from Ljubljana, it’s hard to get super psyched for Slovenia’s second biggest city, Maribor. But even if it doesn’t impress as quickly as the pretty little capital, Maribor makes for a decent day trip if you wanted to see another side of Slovenia. Like most in old European cities, you’ll probably spend most of your day trip to Maribor in and around the delightfully-pleasant Old Town. The main square, Glavni trg, is classic Central Europe, throwing off an unmistakeable Austrian vibe. It makes sense, considering Maribor is closer to Graz than to Ljubljana! Peer around Old Town, hitting up famous sights like the Plague Memorial (Kužno znamenje) and Town Hall (Mestna hiša Rotovž) on Glavni trg, Maribor Castle, and the simply-named Cathedral (Stolnica) on Slomškov Square (Slomškov trg). One must-see in Maribor for wine lovers is the Old Vine, certified as the oldest surviving vine in the world. You’ll find it across the Old Bridge (Stari Most) in Lent, Maribor’s oldest area. The vine itself is a little anti-climactic, but wine lovers will rejoice in the chance to taste fine Slovenian wines at the Old Vine House. If you’re lucky enough to find yourself in Maribor at the end of September, eat, drink and be merry at the annual Old Vine Festival, a celebration of the wine harvest. It’s the highlight of Maribor’s tourist season and the biggest festival of its kind in Slovenia. Craving a chance to save time and pack more into your day? Visit Maribor, Ptuj and the Slovenian wine region with the Maribor, Ptuj and Jeruzalem Day Trip from Ljubljana! Either the train or bus will be fine to get from Ljubljana to Maribor. Not all trains or buses are equally convenient though. The best options for day trippers are the 8:05 train (1 hour and 50 minutes) and the 8:20 bus (1 hour and 40 minutes). Fast direct trains return to Ljubljana from Maribor every 2 hours until 19:48, while the last bus leaves Maribor for Ljubljana at 17:05. You can check train schedules here and bus schedules here. It’s unlikely Koper will capture your heart as quickly as its coastal peer Piran. But not far beneath the surface of Slovenia’s biggest port is a charming old Venetian city that beckons you to explore. Kick off your day trip to Koper at Titov trg (Tito Square), the central square of Koper’s Old City. On it, you’ll find the unmissable Praetorian Palace, a Venetian architectural masterpiece dating back to the 15th century. Pop into the Praetorian Palace for a free tour to learn about the history of Koper. After visiting the Cathedral of the Assumption and snagging a high-up city view in the Campanile (bell tower), head south on cobblestoned Čevljarska ulica to explore Koper’s Old City by foot. Don’t end your day trip to Koper without chowing down on some yummy Istrian food in a traditional tavern. Buses are generally the quickest way to travel between Ljubljana and Koper. The travel time for most routes is about 2 hours. There’s a daily bus at 7:40 (2 hours and 3 minutes) and 10:00 (1 hour and 30 minutes), and buses at 8:15 (2 hours and 8 minutes) every weekday. The train at 9:42, taking just over 2 hours, is another good alternative. Venice is slightly out of reach for day trippers. 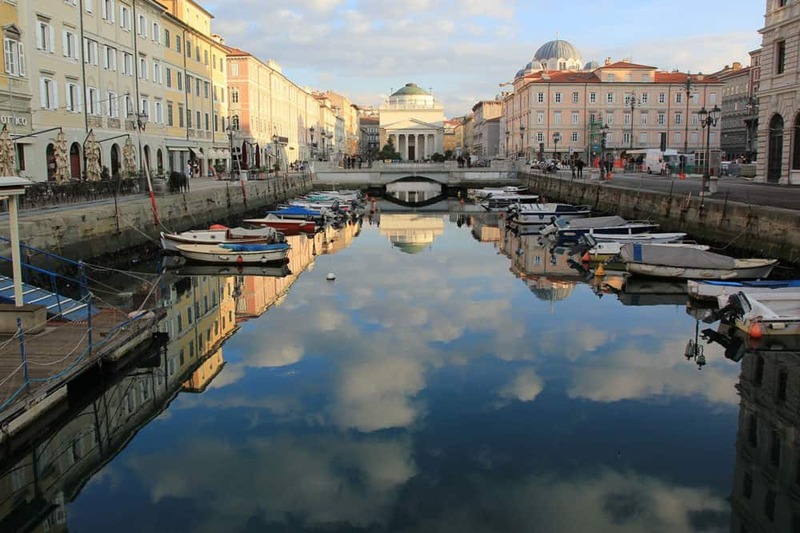 Should you absolutely need to breathe a little Italian into your life, Trieste is your ticket. Sure, Trieste doesn’t ooze the charm of Italy’s tourism behemoth across the bay. But don’t let that stop you from getting to know this compact Istrian coastal city. The influence of Latin, Germanic and Slavic cultures is immediately noticeable. Start your day trip to Trieste wandering about Città Vecchia (Old Town), a medieval maze of cobblestoned alleyways. Scope out some of Trieste’s most impressive sites in and around Old Town including San Giusto Cathedral, San Giusto Castle, and the Roman Theatre. Walking from Old Town towards the sea, you find yourself in Trieste’s Austrian Quarter. Built during Austro-Hungarian reign, the Austrian Quarter reflects the incredible architecture of the times, incorporating Art Nouveau, Neoclassical and Baroque styles in grand fashion. One of Trieste’s most iconic sites, Canal Grande, lies a couple blocks northeast along the seaside from Piazza Unità. After snapping a few obligatory photos of the canal alongside a bronzed and dapper James Joyce, head back into town to spend the rest of the day church- and palace-hopping. Rewind with a coffee and a strudel at Caffè San Marco, a historic café that evokes fin-de-siècle Vienna. Since the train to Trieste (Trst in Slovene) is far too long, your only real option for public transportation is by bus. There are several daily buses from Ljubljana to Trieste. The most convenient options for day trippers are the daily 7:10 and 7:50 departures taking just over an hour and a half. Returning from Trieste, the last fast bus departs at 17:45. Verify departure times here. Backdropped by the Kamnik–Savinja Alps, Kranj is something straight out of a fairytale. Smack-dab between Ljubljana to the southeast and Bled to the northwest, many travellers pass by Kranj, but only a few drop in. Here’s your opportunity to see this incredibly alluring Slovenian city with little distraction. To kick off your day trip to Kranj, deposit yourself into the historic Old Town. Adjust your bearings at Glavni trg, the expansive main square that stretches through the centre of Old Town. On the square itself stands a few of Kranj’s most recognizable landmarks including St. Kancijan Church (Cerkev Sv. Kancijana) and Town Hall (Mestna hiša). Art fans should pop their heads into the Town Hall (€2.30) to gaze upon the sculpture, archeology and ethnography exhibits. Before you leave Glavni trg, if you can, don’t miss the Tunnels of Kranj. These abandoned underground passages have lurked below the surface of old town since before the Second World War. The longest tunnel, a 1.3-kilometre air raid shelter built under Old Town by German occupiers, is the most interesting of the bunch. Tours of the tunnels, at time of writing, depart on Tuesdays and Fridays at 17.00 and on Saturdays and Sundays at 10.00. Buses from Ljubljana to Kranj depart about every 15 minutes from 5:15 am onward. The journey usually takes less than 40 minutes. Trains depart a little less frequently, but travel slightly faster than buses. Coming from Ljubljana, less than an hour down the road, sleepy little Kamnik may not surprise or shock you. It’s not as if beautiful medieval old towns are a rarity in Slovenia. Somehow, Kamnik is special though. Perhaps not only for the town itself, but for what lies beyond. Let’s not get ahead of ourselves: what lies within isn’t so bad either. Start your day trip to Kamnik walking along Šutna, the heart of the medieval Old Town (Staro mesto). The remarkably well-preserved buildings on Šutna will put a smile on your face as you wander to the far reaches of Old Town to Glavni trg, the main square of Kamnik. Along the way you’ll glimpse Mali Grad (Small Castle). There’s not much to see at the castle itself, but the views of Kamnik from the hilltop are worth the small strain. Breathe in the views at Mali Grad before heading across Kamniška Bistrica for a hike up to Stari Grad (Old Castle). Like Mali Grad, Stari Grad’s star attraction is the view. Peer north for epic vistas of the Kamnik Alps and south towards the capital. If you’ve got some extra time to burn in Kamnik, try to arrange a visit to Velika Planina, a mountain plateau bedecked with traditional Slovenian villages. From Kamnik you’ll need to find your way to Kamniška Bistrica Gornji Grad where a cablecar to whisk you away to Velika Planina awaits. Want to explore Kamnik and its surroundings in more depth? Hop onto the Kamnik and Velika Planina Small-Group Tour! Besides Kamnik, the tour visits Velika Planina as well as the Mali and Veliki Predaselj gorges. To get to Kamnik from Ljubljana, trains are the quickest option. Trains depart approximately hourly starting at 9:15 and the journey takes about 40 minutes. If you wanted to start your day earlier, buses begin leaving at 5:00. The ride is only slightly longer with most buses taking about 50 minutes to an hour. If Škojcan Caves is for the science geeks, Postojna Cave is for the rest of us. No other cave system in Europe gets more visitors, and it’s not surprising: Postojna Cave is pretty spectacular. Over 20 kilometres of karst cave spreads underground at Postojna, transporting you into a mysterious world like none you’ve ever seen. Begin your day trip to Postojna puttering along the cave’s electric railway, first built in the late-19th century, toward the hall of the Great Mountain. Experienced guides will walk you the rest of the way through Postojna Cave (tours available in 15 languages) where you’ll be dazzled by grand geological formations that evoke images of the otherworldly. The guided tour lasts about 1.5 hours. Be sure to dress warmly (the caves sit at a chilly 8-10˚C all year round) and wear shoes with good grips to avoid slips. Want to visit both Postojna and Predjama Castle in one day? It’s no problem with the Predjama Castle and Postojna Cave Tour! This small-group half-day tour includes hotel pickup and drop-off in Ljubljana. There are several buses a day from Ljubljana to Postojna. The journey times range between 45 minutes to 1 hour and 12 minutes. For launching a day trip, the 7:40 or 8:15 options, clocking in at about 45 minutes, are the best options. Even if you’re already “castled-out” on your Eurotrip, I promise this will be different. 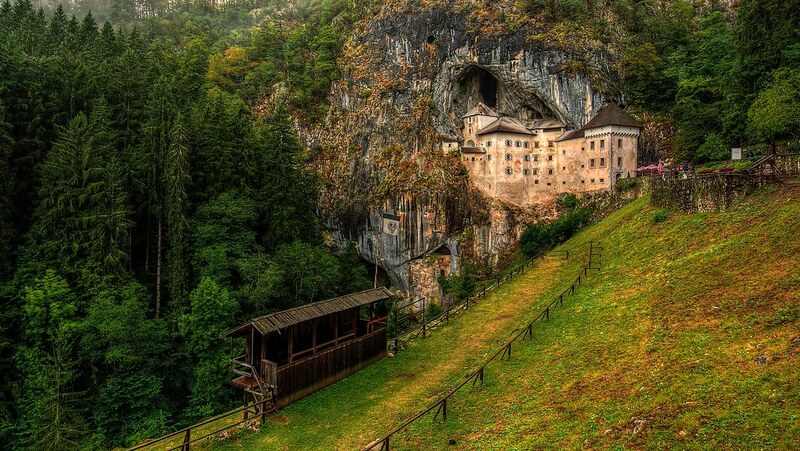 Predjama Castle, carved dramatically into the side of a cliff, is one of Europe’s finest. All it takes is one glance from the outside to know: Predjama Castle meant business. It’s even stocked with it’s own “Robin Hood” story. Building started back in the early 13th century, but the castle’s most famous inhabitant didn’t pop in until a couple centuries later. After killing a high-ranking official in Vienna, Erazem Lueger, a rebellious 15th-century knight and robber baron, fled to Predjama Castle to escape his fate. Even with the Austrians out for his head and the castle under constant siege, Erazem continued to cause mischief, attacking Habsburg estates and killing the Austrian emperor’s kinsmen. No one could figure out how Erazem did it until they snuck a closer peek at the castle. Besides the interesting castle interior, including living quarters, dungeon and a chapel, a mysterious cave system lurks below. Visiting the caves is only possible from May to September as its a hibernation ground for bats during the winter months. If you really want to understand how Erazem pull off his hijinks, brave out Erazem’s Tunnel, a narrow passageway that leads sneakily from the castle into the valley. You’ll need some minor climbing skills and a high tolerance for tight spaces to escape like Erazem. It’s a little more difficult to reach Predjama Castle from Ljubljana with public transportation. First, get yourself to Postojna via bus (check the section above for more info). From Postojna, it’s a 10-kilometre ride to Predjama Castle. During high season there’s a free shuttle bus for those who’ve purchased the joint Predjama/Postojna pass. Otherwise, you’ll have to snag a taxi, which will set you back approximately €12 each way. Predjama Castle and Postojna Cave Tour: A half-day tour from Ljubljana covering both the castle and the incredible Postojna Cave. Both tours include hotel pick-up and drop-off in central Ljubljana. 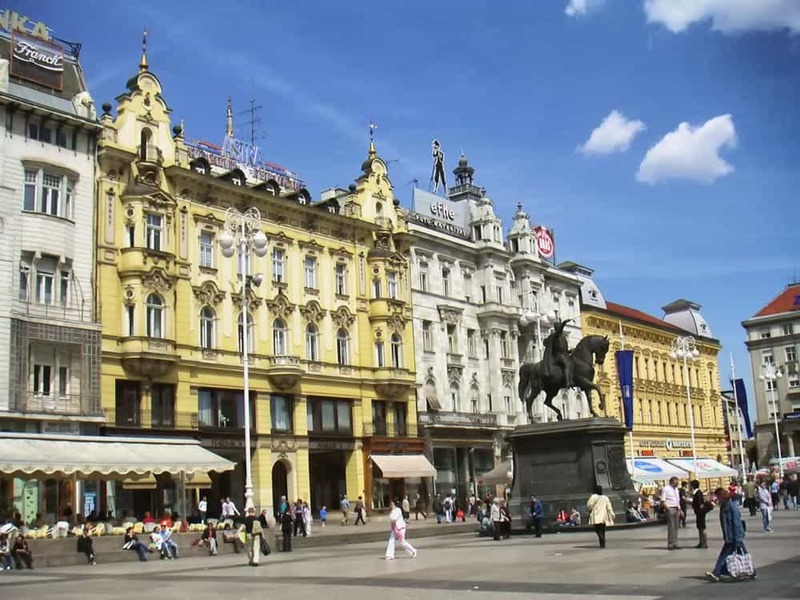 With the Croatian coast priming visitors not so far away, Zagreb doesn’t feature on as many itineraries as it should. The unassuming capital of Croatia is a worthy city break destination in its own right, with classic Central European grace and a bustling city centre to prove its point. Although it’s usually done the other way around, a day trip to Zagreb will be the best urban outing from Ljubljana. Begin your journey in Gornji Grad (Upper Town), the medieval centre of Zagreb. Architecture fans should keep on the lookout for St. Mark’s Church (Crkva sv. Marka) and The Cathedral of the Assumption of the Holy Virgin Mary (Katedrala Uznesenja Blažene Djevice Marije), the tallest building in Zagreb. The museum scene in Zagreb is one of Central Europe’s finest, especially if you’re into art. Muzej Mimara (Mimara Museum) and Arheološki Muzej (Archaeological Museum) are among the Zagreb’s best attractions for a casual visit. Most Zagreb museums are closed Monday, so plan ahead your day trip if you want to pop in. Either the train or bus can get you to Zagreb from Ljubljana. Both options take about the same time (about 2h20m to 2h30m) and offer early morning departures. There’s hardly a European capital that’s easier to find out where to stay than Ljubljana. Many of the best hotels in Ljubljana are located in and around the Old Town where you’ll be spending much of your time in the city. The central train & bus stations are close by too, making it a convenient place for your day-tripping pleasure. Bed & Breakfast Atticus: A good budget choice in a convenient city centre location. Rooms with both private & shared bathrooms are available. City Hotel Ljubljana: A fantastic mid-range hotel located just blocks from the main train & bus stations. Amenities include a rooftop terrace, restaurant, and fitness centre. Vander Urbani Resort: One of Ljubljana’s top luxury choices, this boutique design hotel sits near the banks of the Ljubljanica River in the shadow the castle. The rooftop terrace pool, offering spectacular views unto the Old Town, is a brilliant touch.